The only riodinid we found in our park. This punchinello love to rest on top of fern leaves under the tree shades. 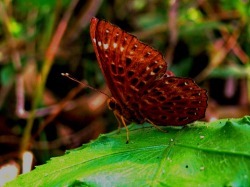 Another picture of punchinelo, this butterfly usually seen in lower part of our park. Punchinello is quite rare in our park.